MSU asks myositis patients to “Celebrate your Caregiver” in recognition of its two-year anniversary as a non-profit. LINCOLN, DE, UNITED STATES, August 1, 2017 /EINPresswire.com/ -- MSU is a 501(c)(3) non-profit organization founded on July 30, 2015, for patients living with, and for loved ones caring for someone with, Myositis, a rare and debilitating autoimmune disease. Myositis is a rare disease estimated to affect between only 50,000-75,000 people in the United States. In recognition of everything Myositis Caregivers provide, MSU is asking patients to “Celebrate their Caregivers” and share the experience through videos, photographs, and articles to be distributed on the Myositis Support and Understanding website and social networking sites. "Myositis is an opportunity for us to be aware and intentional every day with our loved ones, a constant reminder to reflect and be grateful for the abilities we have and the people we love." Rick Boling, a family member of a myositis patient and co-caregiver with the rest of the family. Due to the nature of the Idiopathic Inflammatory Myopathies2, patients often experience debilitating muscle weakness, fatigue, chronic pain, uncomfortable to painful skin rashes, trouble swallowing, lung disease, as well as other organ involvement. In some cases, especially with Inclusion Body Myositis (IBM) and refractory cases or advanced forms of polymyositis, dermatomyositis, or necrotizing autoimmune myopathy, full disability can occur in which patients require full assistance with activities of daily living, known as ADL’s. When patients progress to this level of disability caregivers become a necessity for patients to function. 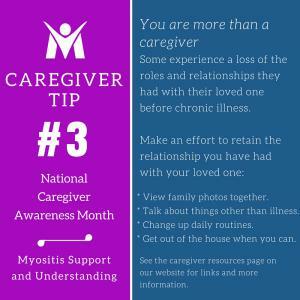 Myositis caregivers dedicate themselves to ensuring that their loved ones maintain a level of human dignity and independence, often allowing them to stay in their homes longer than they could without assistance. Family members expand their roles in the lives of the patient far past the role of typical spouse, child, sibling, parent, friend, cousin, to that of nurse, bather, cook, housekeeper, dressing assistant, medication giver, lifter, chauffeur, massage therapist, hugger, cheerleader, doctor appointment companion, patient advocate, medical bill juggler, grocery shopper, and so much more. Myositis Caregivers give help that is immeasurable. It is always appreciated, if not always acknowledged as it is sometimes embarrassing for the patient. Caregiving is a difficult task by itself, let alone for those who also hold down full-time employment. Sometimes the dual role as spouse and caregiver can bring couples closer together or, as we have seen in some cases, tear their marriage apart; this is yet another unfortunate side effect of myositis. Penny Bundy, Treasurer of MSU says, "My caregiver is my husband of 27 years, who has more than willingly stepped forward to take over household chores, cooking and whatever I find myself unable to do. But even more than that, while I am quite happy to putter around the house doing what chores I can, or work on my computer, or just sit and read, he reminds me that I need to get out doors to enjoy the fresh air and the sunshine. If not for him, I would sit indoors all day just watching the world go by. Going out is such a chore for me that I repeatedly turn down his offers for a ride or a short shopping trip. But he continues to ask until I finally give in, and discover the rewards of the outing far outweigh the trials of getting out and into the car to go. I appreciate so much that he looks out for my well-being in areas that I forget to watch". Each patient with myositis is different in what they require as far as physical assistance. Some may only need help with outside of the house things like transportation while others may require around the clock assistance that includes bathing, feeding, toileting, and other activities of daily living (ADL’s). Caregivers are a diverse group and the definition, as we have seen in our support groups, can be applied to many people in the patient’s life. For some, it is a special friend that lends a hand when needed. For others, it’s their spouse. And yet for some, it may be a professional that visits the home or the patient relocates to an assisted living facility. MSU is focused on ensuring that caregivers get the support they need and deserve. “We want to ensure that our Myositis caregivers have a safe place to ask questions that are specific to myositis, a place to vent, and the ability to share difficult emotions that often arise. This is why we have an online support group that is specific for caregiver needs and that provides that safe place just for them,” says Jerry Williams, Founder and President of MSU. What has MSU accomplished over the past two years? -	Through its financial assistance program, MSU has provided thousands of dollars in medical and home expense assistance helping myositis patients keep their homes, pay their medical bills, and ensure they have the necessities to be able to reach out for the support that is so needed when living with a rare disease. 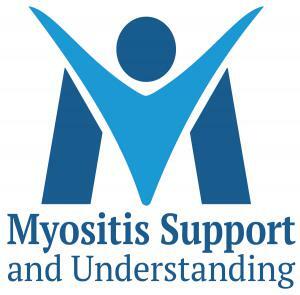 -	Hundreds of educational, informative, and supportive articles written specifically for those living with myositis3. -	Dozens of interactive, face-to-face video chat sessions hosted for myositis patients and caregivers to get information, education, and support. -	Thousands of member posts hosted in the support groups, answered, and conversed by other patients who understand each other. -	Information disseminated about clinical trials, pertinent products, and the latest myositis research. -	Information pamphlets and literature provided to patients and doctors about myositis and about MSU. -	A constantly growing, interactive, and easy to understand website providing education, support, myositis patient programs, patient-submitted content, and hundreds of resources for myositis patients and caregivers. Myositis Support and Understanding (MSU) is dedicated to improving the lives of Myositis patients through public policy, self-advocacy programs, need-based financial assistance for medical-related and personal expenses, and to provide support and education to patients, caregivers, healthcare providers, the general public, and legislators about Myositis. MSU was founded by Myositis patients, for Myositis patients.